My husband has been on vacation this week and we've been getting a lot of things done. One of them is the new look to my blog, I love it! The week isn't over yet, we still have some general living to do. I had a lofty goal for my cards today and the day isn't over, I may squeeze a couple of more in. 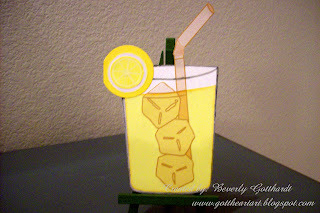 Supplies: Card Blank White 41/2" X 61/2" cut out with the Cold Drink card template-Oriental Trading Co., Hot Off The Press Paper Pizazz-yellow pastel vellum, ice cubes and straw-Printmaster 11, Stamp: Oriental Trading Co.-Clear Stamps Fruit Salad, Ink: VersaMark Ink Pad, CTMH-Z2152 Sunny Yellow, CTMH markers-sunflower, sunny yellow, sunkiss yellow, grey flannel, Inkadinkado-Artistic Blending Chalks, cotton ball, Fiskars Shape Cutter-Circles 1, Coluzzle Cutting template-circle, Xyron 500 sticker machine, my hand writing for inside sentiment. This is really fun! Love the shape. This is very cool! Love the shape and the color is so bright and cheerful. 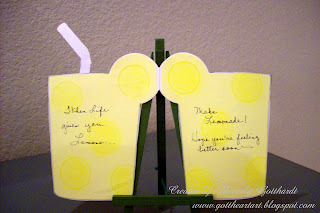 Modern Sugar Blvd is having a shaped card challenge this week. Check it out and you could combine 4 challenges in one card! Although, I don't know if you're required to use a MSB stamp or not. Might be worth looking at! Anyway, love this card. It's awesome! Hi Bev...very clever card! I love lemonade! Thanks for joining us this week on 3CTC!